We voted on an increase in our Sewer Rates at the Council of a Whole Committee Meeting on Tuesday Night; Unanimous 10-0 (Green absent). 3. Largely we need to fund projects per consent decree with EPA; violations of the clean water act with sewer overflows into River due to CSS system. 4. We have 134 miles of Gravity Sewer Lines and +/-9.2miles of CSS (Combined Sewer System) lines which need to be addressed (to reduce amount of storm water we treat). 5. 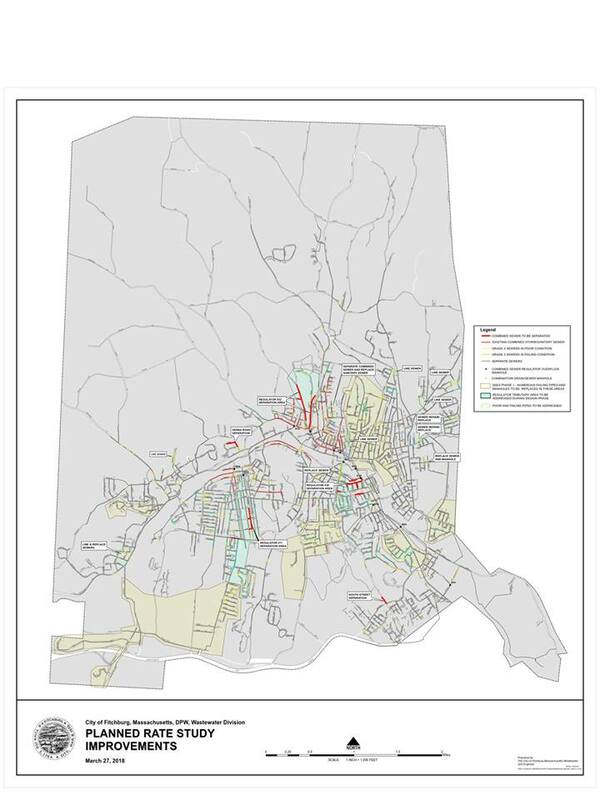 The majority of Fitchburg is on Sewer Lines. 7. We also need to upgrade the east treatment facility to improve performance and reduce nutrients per EPA. 3. Per the EPA Consent decree from 2010 for the East Plant near Airport Rd, we still have to complete a Secondary Systems project and a Tertiary Systems Project-- to reduce Nutrient Pollution such as Nitrogen and Phosphorus. a. The Secondary System Upgrade bid was awarded in Jan 2017, est to begin construction Oct 2019, the total awarded contract price was $20.3M and the total estimated cost for the Teritary Treatment upgrade was $22.1M in 2012. 6. We were discussing an anaerobic treatment a couple years ago but have held off on that discussion in recent years. Was the discussion on a Fitchburg facility only or a regional anaerobic treatment facility? One that increased our economy of scale? ....for example one that handled Fitchburg, Westminster, Lunenburg, Gardner, Templeton, Ashburnham and whatever other areas the Templeton treatment facility/Gardner Sludge Landfill covers and/or whatever other customer load we could handle? a. Distribute cost and money-saving benefits among the communities it would serve? c. Locate this at the West Fitchburg Pumping Facility?